Sesimbra Portugal Tourism Guide - Fully Updated for 2018! Sesimbra is one of the finest resort towns of Portugal, and is adored by the Portuguese, being famed for its freshly cooked seafood and pristine coastline. Since the recent explosion of tourism, Sesimbra has been transformed into a bustling but welcoming resort town, which retains its character and heritage. Aside from the beautiful beaches and delicious food, there is a lot to do within the Sesimbra region. There are hiking/biking trails through the Serra da Arrabida, surfing on the Costa da Caparica, kayak or boat tours along the dramatic coastline and some of the best diving in Portugal. As for day trips, fascinating destinations include, the cliffs of Cabo Espichel, the busy port of Setubal or the paradise beaches of the Tróia Peninsula. Sesimbra is a fantastic destination for tourists seeking an authentic Portuguese holiday experience, which combines wonderful beaches with a wide host of sights and activities. These tourist attractions also make Sesimbra an enjoyable day trip from Lisbon, which is only 30 minutes away. This article will provide an introduction to Sesimbra, which is one of the best holiday destinations of Portugal. •	The glorious sandy beach that extends around the entire Sesimbra bay. •	The delicious seafood of the Marisqueira restaurants, for which Sesimbra is renowned for. •	The panoramic views from the battlements of the Castelo de Sesimbra. •	Exploring the varied and pristine coastline by kayak, boat tour or dolphin watching tour. •	The lively and welcoming holiday atmosphere, along with the multicultural social nightlife. • The picturesque Portinho da Arrábida coastline, which encompasses Portugal’s most beautiful beaches. • The Serra da Arrábida nature park, offering challenging hiking, stunning vistas and scenic drives. •	The Cabo Espichel, a wild and exposed headland, with its unique church, lighthouse and two sets of dinosaur footprints. •	Wine tasting in the town of Azeitão, the heart of the Setubal wine producing region. •	A day trip to the busy working port Setubal, with it’s colourful harbour and pretty waterfront. Why have a holiday to Sesimbra? Sesimbra is a wonderful holiday destination that offers glorious beaches, interesting day trips and a relaxed ambience. Sesimbra’s unique appeal is that the town is primarily aimed for Portuguese tourists, making it is an ideal location to embrace and immerse in Portuguese culture. As Sesimbra is designed for Portuguese tourists, you can expect great food, late nights and exceptional value for money. Sesimbra is in an area of amazing and diverse natural beauty. 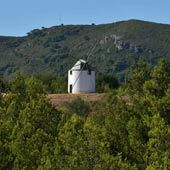 To the east are the rolling hills of the Serra da Arrabida that conceals a coastline of stunning beaches and tranquil seawaters. While, to the west are the towering cliffs and exposed headlands of Cabo Espichel, which are battered by raging seas and powerful winds. Sesimbra has the added advantage of being close to Lisbon; the airport is less than a 30-minute drive away or a 45-minute bus ride away. A visit to Lisbon could be easily combined with a short stay at a traditional beach resort as delightful as Sesimbra. Sesimbra is close enough to Lisbon so that the town and surrounding region could be visited as a day trip. Sesimbra is a mainly a beach resort, but there is the castle, fishing harbour and beach promenade to explore. The day trip could also include the cliffs of Cabo Espichel, and if you have a rental car, the Serra da Arrábida. 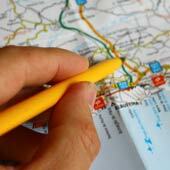 For a full guide to day trip to Sesimbra, please click here. Portugal is experiencing a massive resurgence with its tourism, and most notable, tourists are venturing away from the established holiday destinations and seeking out new and exciting locations. This includes Sesimbra, which only a few years ago was virtually unheard of, and now is an open secret, with many tourists returning or recommending to friends and family. Sesimbra is expecting an outstanding 2018 season, and this based upon the sell-out 2017 summer. 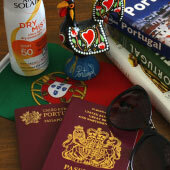 If you are seriously considering a holiday to Sesimbra, book your flights and accommodation now, as they will sell-out. 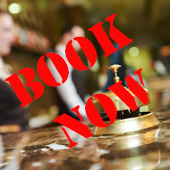 Fortunately, many of the hotel booking websites do not require a deposit, and this allows for free cancellations if plans do change. 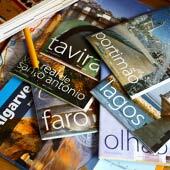 For a guide to the best hotels in Sesimbra, please click here. 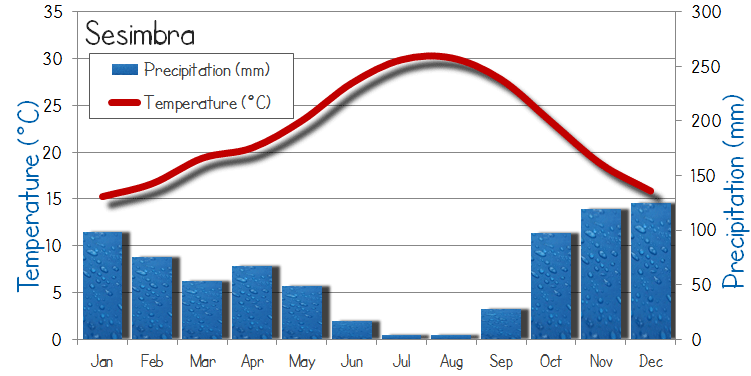 Sesimbra has long hot summers, pleasant spring and autumns, while winters are mild but can be grey and wet. The weather in central Portugal is suitable for spending time on the beaches from May until October. Sesimbra is an extremely popular holiday destination with the Portuguese, who flock here during July and August. This is when the town is at its most vibrant and hectic, with the majority of hotels fully sold out. Outside of the short peak season Sesimbra has a more relaxed and calmer ambience, and tends to attract tourists of a more mature age. Portugal may be mild during the winter when compared to the rest of Europe, but it should not be considered as a winter sun destination. Sesimbra has a large permanent population therefore the town never fully closes for winter, with many restaurants and cafes remaining open. Sesimbra is a great destination for young children and is a popular location for Portuguese families on holiday. It is a very safe destination, which is firmly aimed for families and couples (there are no stag do’s or groups of loutish drunks). The beach of Sesimbra is ideal for children, and there are no powerful waves or strong currents, as the headland shelters the beach from the might of the Atlantic Ocean. Children will be welcomed into all of Sesimbra’s restaurants and as a whole Portugal is a very family focused country. For logistics, English is widely spoken by all who work within the tourist industry and shops stock all common brands and commodities. Sesimbra is 45km from Lisbon airport and there are private transfers for hassle-free onward connections (please see this guide). There are no water parks or theme park near Sesimbra and older children and teenagers may prefer the buzz of the central Algarve to the Sesimbra region. Sesimbra could make for an enjoyable holiday destination for twentysomethings and young couples, so long as if you visit during the summer season and are not looking for a purely drink-fuelled holiday (for excessive drinking go to the Strip in Albufeira). In the summer Sesimbra is filled with many similar aged Portuguese, and there is surprisingly good nightlife for the size of the town, along with the beach parties of the Costa da Caparica. Sesimbra is also a centre for adventurous activities, including coasteering, sea kayaking, diving, mountain biking and surfing, and there are many agencies which can organise these adrenaline-inducing tours and activities. As an added bonus, Sesimbra is a great value destination, where food and drink will be significantly cheaper than the established resorts in Greece or the Balearic Islands. Outside of the summer Sesimbra calms and matures, and maybe too quiet for certain visitors; for this time of year head to Lisbon or the Algarve. Are there good beaches in Sesimbra? Some of Portugal’s finest beaches are found within the Sesimbra region, and anyone considering Sesimbra for a beach holiday will not be disappointed. The town of Sesimbra is situated on a wide sandy bay, with the Fortaleza Santiago fort dividing the beach into two, and the fishing harbour on the western side. For a full guide to the beaches of Sesimbra, please click here. To the west of Sesimbra are the pristine beaches of the Portinho da Arrábida (the name given to the Serra da Arrabida coastline). These beaches are picturesque; with crystal clear waters, soft golden sands and the backdrop of the lush hills of the Serra da Arrabida. The largest beach of the Portinho da Arrábida is the beautiful Praia do Creiro, and this is often considered as Portugal’s finest beach. To the north-west of Sesimbra are the rugged surfing beaches of the Costa da Caparica. This coastline extends along the entire western side of the Setubal Peninsula and forms an unbroken sandy beach of 13km. The southern sections of the Costa da Caparica have almost no tourist development, and this untouched natural setting is difficult to believe, being so close to Lisbon, Sesimbra and Setubal. 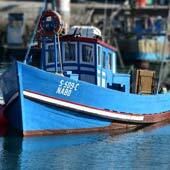 Sesimbra is celebrated for its seafood, which is based around the freshly caught fish from the town’s fishing fleet. The best location to savour these regional specialities are in the family run Marisqueira restaurants, that are found down the small back alleys of Sesimbra. The most popular dish is Arroz de Marisco, a delicious meal of shellfish, crabs and rice that is served in a large clay pot and is designed to be shared. There is no better accompaniment to this meal than a bottle of a locally produced wine. For the Portuguese, the evening meal is an important time for the family to gather, and the meal is never rushed, so embrace the local culture and enjoy an extended evening meal of freshly caught fish. 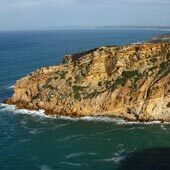 The Cabo Espichel is the dramatic and windswept headland on the southwestern tip of the Setubal Peninsula, and is a region of raw, natural beauty. Perched at the top of the colossal cliffs is one of Portugal’s most powerful lighthouses, while in the exposed cliff faces are two sets of dinosaur footprints. The bleak headland was once an important pilgrimage destination and there is a unique church complex which includes pilgrim’s accommodation. Cabo Espichel is a good excursion from Sesimbra, and for a full guide, please click here. The Serra da Arrábida are the limestone covered hills that lie between Sesimbra and Setubal. This lush landscape is covered in evergreen shrubs and bushes, and raises from the picturesque beaches of the Portinho da Arrábida up to the Formosinho point, 500m above sea level. Within the Serra da Arrábida are numerous enjoyable hiking trails and challenging cycling tracks that cross the steep hills of the national park. For the less energetic, take a drive through the centre of the park and admire the wonderful views from the Estrada de Escarpa. For a guide to the Serra da Arrábida, please click here. The ancient castle of Sesimbra dates from the Moors era (8-11th century) and from the battlements are wonderful panoramic views over Sesimbra. The castle has been greatly restored, with a lot to explore, and always has a peaceful ambience, as it is a challenging 20-minute uphill hike from the town. 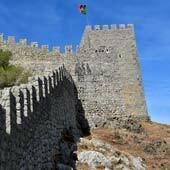 For a guide to the Castelo de Sesimbra, please click here. 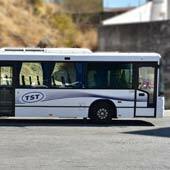 Can I travel to Sesimbra using public transport? There is a regular bus service from Lisbon to Sesimbra that departs from the Praça de Espanha bus station in Lisbon. The journey takes 45 minutes, and a single bus ticket costs €4.15. For a holiday it may be worthwhile considering a rental car as there is poor public transport around Sesimbra (Cabo Espichel/ Serra da Arrábida/southern Costa da Caparica). For a full guide to travelling between Sesimbra and Lisbon (including the airport), please click here.